All businesses share in common the need to direct incoming and outgoing telephone calls efficiently. The way that they do this is by using a PBX (Private Branch Exchange) system—a type of hardware and/or software that connects calls to and from phone extensions within the business. When it comes to choosing the right PBX system to use for your small business, there are a number of factors involved that will sway your decision toward using a particular system. The best way to get a handle of these factors is to examine the benefits and drawbacks of the different types of PBX systems that are available. The first two PBX systems we will discuss are systems that must be installed and maintained on the premises of your small business. These are on-site PBX systems. The Hosted PBX system is off-site or "in the cloud". It is maintained and operated by an external company that you pay for services. Hosted PBX systems utilize Voice over Internet Protocol (VoIP). 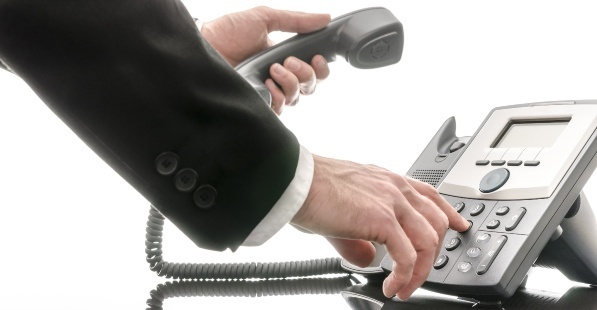 A traditional PBX system gains its name from its use of “traditional” landlines. This means the PBX system is actually hard-wired to analog or PRI copper circuits. Popular vendors for traditional PBXs are Nortel, Panasonic and Vodavi. Out of all the options available for PBX systems, a traditional PBX can be the most reliable. These traditional PBX systems allow communication to take place on dedicated lines that also provide excellent voice quality. But as you might expect it is difficult to add additional lines to traditional PBX systems because of the physical wiring that is involved. For this reason a traditional PBX is suitable for small businesses with office space that already has this wiring in place. As long as all the equipment is present, a traditional PBX can be less expensive than other PBX systems. However, having the right equipment present comes with its own costs, since all necessary maintenance must be provided on-site. If your small business lacks somebody with the knowledge and ability to troubleshoot a traditional PBX system, this will incur additional costs as you hire an independent contractor to do the troubleshooting for you. An IP PBX system allows calls to function using VoIP. This means that all of the information that is passed through phone communication is converged with your data communications and relayed using Internet Protocol (IP). Amongst the industry leaders for IP PBX systems are Avaya, Cisco, Mitel and Shoretel. The convergence of data over the communication network means each call is less expensive than it would have been if it had been routed through a traditional PBX. If many calls are placed, especially if they each have a long duration, then an IP PBX is more cost effective per call. Since this is an on-site PBX, all hardware and software that is required for the IP PBX must be purchased and installed at the expense of your business. This results in an up-front cost though leasing arrangements can be negotiated, as well. Also, as with all VoIP PBX systems, if the Internet connection is lost, then the ability to make calls is also lost. If a reliable Internet connection cannot be maintained at your small business, the ability to make calls will not be reliable either. So, it is important to consider having some analog line circuits in place for backup in case of a WAN outage. A hosted PBX is an IP PBX that is provided by an off-site VoIP company. Since the company is hosting your PBX system, monthly fees are required. In two ways these monthly fees are usually reasonable for small businesses. In the first place, a hosted PBX often comes with features that allow unlimited free calls to be placed to certain locations around the globe. Also, unlike an on-site IP PBX, there are no initial investment costs for equipment and software installation, though you may need to purchase your handsets. Polycom is the leader for handsets that are used in Hosted PBX deployments. It is also important to consider the number of lines you wish to access from the hosted PBX. Over time, the cost per line may actually be higher than if you would have simply used an on-site IP PBX for that same time period. Additionally, the use of VoIP can affect the quality of the calls that are routed through the hosted PBX. Since VoIP uses data compression that is then sent through the internet, a number of factors can make voice and visual communication that is sent through the hosted PBX less than ideal. The recommended way to optimize your phone service quality is to choose a provider that is offering the data connection, too. This enables your PBX system to reside on your data network, creating a walled garden that mitigates jitter and latency that may occur when calls go over the public Internet. With all of the options that are available, choosing the right PBX system for your small business takes considerable time and effort. Not only that, but you also have to consider who your phone service provider will be, what kind of customer service they provide, and what kind of pricing you will pay for the service you need. If you would like to receive advice for your particular needs as a small business owner, Atlantech Online's phone service experts can help you make the best decision for your business. In any case, we hope the information you have found here has placed you one step closer to establishing a more efficient business. Moving to the cloud improves every aspect of communications for both small business and enterprise, making it easy for customers, partners, and staff to connect via telephone and conference in others, regardless of their physical location. Picking through the various options for IP PBX to find the right fit for your business can be challenging. To make a wise decision, you'll want to ask the following questions. Will your business be able to add lines and functionality on an as-needed basis to support growth? Is is easy to change your plan if need be? Does your potential provider have an option for a direct connection or is phone service over the public Internet? What are the fee and billing structure? 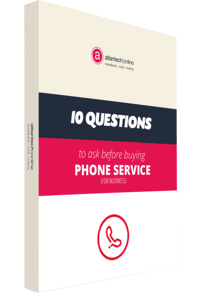 Do you need to buy telephones? Are there any additional fees for support? How long has each vendor been in business? What is their reputation for customer service? Does this phone system offer the features you require? Are they easy to implement and use? What kind of options are for customization are available to you? Do they meet your company's needs? The market is diverse, with many competitors fighting for customers in a commodity market. The major carriers offer nationwide coverage with a wide scope of services, from data centers to phone service. Smaller local and regional providers often re-brand and bundle services as a reseller of the large incumbent providers. Others provide their own Internet connections, but may not have options to upgrade to a direct connection. Here's a closer look at these options and some of the providers worth evaluating. Companies like Vonage that offer phone service to homes and businesses are recognized nationwide and are a quick and easy phone service provider. For the vast majority of households and smaller companies, these Vonage may be a strong option. Fonality is another choice, recognized as a top business VoIP solution by PC Mag. By offering some advanced business-centric capabilities, Fonality bridges the needs and cost requirements of very small to medium-sized businesses. 8x8 is another strong contender with functionality to support virtual offices and call centers. What do we mean by Bring Your Own Bandwidth or BYOB? The providers mentioned above offer a variety of Internet solutions to power the phone system. What they have in common is that they all rely on the public Internet, what we call BYOB, to operate. BYOB Internet does provide some challenges, especially for organizations that are dependent on communications and pushing the limits of their current phone systems. On a shared connection, your phone call goes out into the world in packets which bounce around and then all meet up again at the other end of the line. On a shared connection, packets may arrive in the wrong order or even get lost or delayed along the way. These slight data packet miscues can result in static, jitter, latency and dropped calls. Another common complaint of organizations on low-cost systems is the reliability. When you have a multiple-vendor solution, it is easy to feel like everyone's pointing fingers at each other when troubleshooting. Is the problem occurring in the phone system data center, wiring in your office, or at your ISP? When the Internet "goes down" you have to investigate throroughly in order to pinpoint the problem. Meanwhile, your business is at a standstill. While BYOB Providers may be inexpensive solutions for smaller businesses, companies that rely heavily on communications need higher quality of service. Having a direct connection to your hosted PBX switches is a night and day difference for most users. Not only that, but providers who supply a direct connection can also become a single-source provider for all telecom needs - which is an additional boon for businesses. Vendors that offer unified communications, including direct Internet connections, major cloud service connection, and standalone data centers, may seem beyond your needs right now. But the fact is, small to medium organizations benefit from their ability to join in on the economies of scale offered by these providers. A direct connection from Atlantech Online means all those data packets that make up your phone calls move in one prioritized stream between your phone (wherever you are) and the intended listener. What is the best IP Phone System for Medium to Enterprise Organizations? At Atlantech, we offer a state-of-the-art IP PBX phone system by leveraging our redundant BroadSoft platform. Read more about our hosted phone service options here. A competitive market is always good for the buyer. And there are plenty of choices out there. A low-cost option may initially catch your eye, but downtime, jitter and latency problems, and poor customer service are not worth the risk to your business. A single vendor ISP phone system can better fit your needs and help you scale as necessary. At Atlantech, we bundle the best of all components for our customers. Let us prove it to you. If your small business or enterprise is based in the Washington, D.C., area, give us a call. We will do an audit of your needs and make a recommendation that fits your needs and budgets. Pairing Atlantech services with a best in class PBX system is a solution worth considering. We believe you'll see it is the best option in the D.C. Metro area for IP PBX. Your business deserves to have the best phone service possible. Get the answers you need to make the smartest decision, inside this ebook.